One of our members told me a few months ago that he often puts his fish straight in the freezer when he gets home and then cooks them over the week- straight out of the freezer! I'm a big fan of my freezer- so much so, I wrote a blog about it. But I've never cooked a fish that's frozen solid before. I wanted to give it a go, so dutifully froze some leftover dabs in preparation. I forgot to scale and rinse them, which would have been a good idea. Something to keep in mind if you're planning on doing this kind of thing on the reg reg. I had three dabs, so tried three different approaches- grilled, baked and pan-fried. This is how I normally cook smallish fish. The skin crisps up nicely, so you get some nice Maillard flavours and it's the quickest way to cook a whole fish. I was slightly nervous about grilling a frozen fish though. Normally I turn the grill up to 11, but was worried I might char the skin, without the heat penetrating down to the bone. So I had the grill up to two-thirds. It took a little longer than usual (no surprise there), but actually worked a treat. The skin blistered and had some lovely charred bubbles. If I'd scaled the fish first, I think it would have worked out much better. The flesh has a drier taste and feel, like cooking on wood or charcoal. Although there was a slight hint of burnt taste, which might have come from the charred baking parchment. I rarely pan fry fish. Mainly because I don't like washing up. Baking tray and parchment are my friends. I oiled the pan and had it over a low heat. After five minutes, there wasn't much going on. I turned the heat up a bit and put a lid on. After another 8 minutes it was good to go. Not so firm as the grilled fish (mainly because it had steamed under the lid), but perfectly tasty. The third dab went into an oiled roasting dish and into the oven at 220C. It took 15 minutes to cook and had I not known it was frozen when it went in, I wouldn't have guessed it. Great flavour and texture. For frozen dabs, grilling wins. There is a caveat in this though. I probably shouldn't have used the smallest flat fish there is to test out cooking from frozen. I think anything plumper, like a portion-sized plaice, wouldn't have cooked in quite the same way. The skin would char and the frozen bones would keep the innermost meat from cooking. That's a guess though. 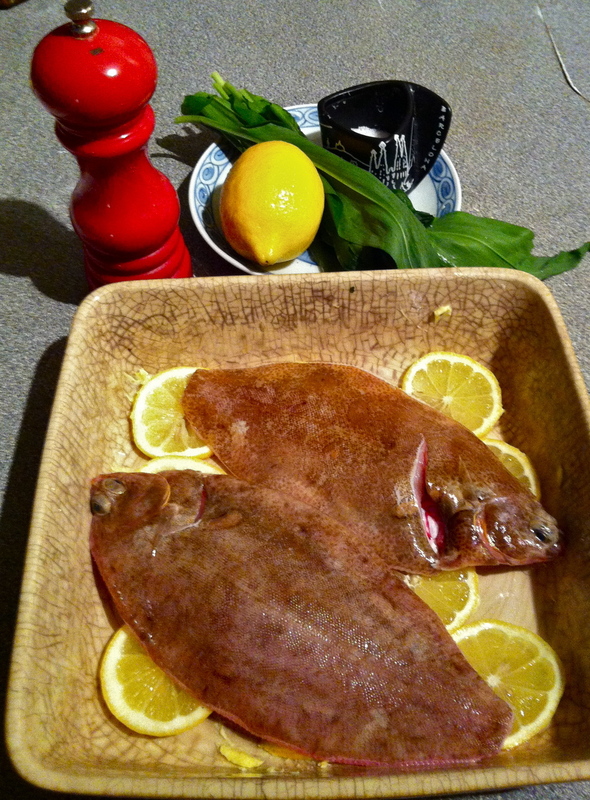 I think a hot oven (220C), would cook most flatfish under 700g, pretty nicely. Sure it'll take longer, but certainly not longer than the 24 hours in the fridge you'd normally spend defrosting it. Something to remember when you've got nothing in the fridge to eat. I over ordered slightly this weekend and was left with half a dozen mackerel at the end of the day. I love mackerel, I could eat them every day. They're an incredibly versatile fish and while I've tried my hand at most things, from ceviche to escabeche, I'd never got round to pickling them. The thought of soused seafood can be off-putting enough for some people, but knowing it's been done by an eccentric amateur can really add to the concern. Still, I thought I'd plunge in with two very different techniques: one Japanese, one Scandinavian. The Japanese shime saba is possibly the best thing I've ever done with mackerel. It's super easy, pretty quick and the melting texture and subtle flavour are really quite something. Please do give it a go, it will blow your mind. At the time of writing, I still haven't had a chance to try the Scandinavian pickle (it's still ruminating in the fridge). But will do a 'how to' in a couple of days (once I can guarantee it's deliciousness). I once ate mackerel raw, on a boat, seconds after dispatching it. It was great. According to the Japanese, that's the only way to do it. As soon as the fish has been landed, they wouldn't dream of eating mackerel as traditional sashimi, it's always cured before it is made into sushi (new to me too). Mackerel deteriorates quickly and within a few days, it can become quite pungent and fishy. This ancient curing technique is used to prevent that. Obviously, the freshness of the mackerel is key here. If you got it from us, then obviously, it's probably still gleaming. If you're not a member of SoleShare however, go to a local fishmongers, this time of year, they should have some. 1. First off, fillet your mackerel (don't know how, join us for a filleting workshop). Make sure to remove the rib bones from the side of the fillet, don't worry about the pin bones running down the middle though. 2. Lay the fillets on a rack and salt generously on both sides. Pop this on top of a dish (the salt will draw water from the flesh and it'll drip). Leave the fillets to cure for an hour. Once they're done, they will be noticeably firmer to the touch. 3. After they've cured for an hour, gently rinse the salt from each fillet under a cold tap. Pat the fillets dry with kitchen towel and pop them in the ziplock bag. 4. Using a potato peeler, pare off a few strips of lemon rind (half a lemon's worth) and add them to the ziplock bag as well. 5. Pour in enough rice vinegar to cover the fish and lemon and sprinkle in a couple of tsps of sugar. Seal the bag and pop it in the fridge for 45 minutes. Squeeze the air out of the ziplock bag and you'll need much less vinegar than you would using a dish. 6. After 45 minutes of marinating, the acid from the vinegar will have cooked the outside of the fish and it'll look opaque. Lay the fillets on a chopping board and gently rub the corner of the shiny side, until the skin starts to come away. Pinching it, gently pull the skin from the fillet lengthways and discard. It's been 'cooked' on the outside by the vinegar. 7. Most sources I checked suggested removing the pin bones that run along the middle of the fillet. I skipped this step (by this point I was ravenous) and didn't notice them. 8. Finely slice the fillet into equal portions about a centimetre in length. Try to do this at an angle. The rack I used to cure the fish left some handy indentations which I used as a guide (see above). 9. Plate up, skin side up and serve with soy and wasabi. Prepare your mouth for a flavour bomb. It tastes even better than it looks. This weeks catch was brought to you by Martin! Martin fishes out of Newhaven on his 16ft open boat, Violet May. He shares our ideas when it comes to responsible fishing methods and sustainability and he's about as low impact as they come. All his fish are caught using a rod and line or static gear. And... SoleShare fish will now be getting chefed up on Thursday nights at Frizzante, Hackney City Farm! Their fish dish this week: 'Fillet of plaice from Sole Share, our local Community Supported Fishery, baked in a bag with fennel, potato and cherry tomatoes, served with a seasonal salad'. Now that's a plaice for us! Sea you back here next week. And we're off! Our spring season kicked off this week with a windy trip down to Kent to collect our fish from Ken and Joe, the father and son team fishing from their day boat the 'Annalousion'. One of our members, Georgia was so excited to get on board this spring that she's going to be sharing her experience of cooking her SoleShare catch every fortnight through the season right here. We'll be including some of her insight and cooking tips over the coming weeks. Here's what she had to say about chefing up her catch of the day in 'Platessa con patate'. Georigia's top tip: I might have had knives sharpened, ingredients laid out, a clean apron on and cameraman at the ready, but I stumbled at the key first step: Read the entire recipe (and in this particular case, keep some potatoes back for the top layer)! Luckily this is such a great recipe and I had two of the freshest, spottiest looking plaice to cook with, so it was delicious anyway. Georgia's discovery of the week: The Marine Conservation Society launched their updated ‘FishOnline’ guide to sustainable seafood (http://www.fishonline.org).